Saint Sylvester, in many languages, shares his name with the last day of the year. In other languages descended from Proto-Indo-European (all languages in Europe apart from Basque, it’s thought) name this day with a name similar to the English. In Scotland, New Year’s Eve is called Hogmanay. Traditionally, it’s a much bigger deal than Christmas, or the Scot’s version, Yule (from Old Norse jól, a midwinter pagan festival lasting twelve days, which brightens up the harsh winter and asks for the return of the sun. Which is rarely seen here, anyway…). Certain traditions such as Yule logs, holly and mistletoe harked back to pagan traditions. After the Reformation, the Kirk, or church, banned Mass – and with it Christmas (or Christ’s Mass). Until as late as the 1960s, Christmas day was a working day for most people in Scotland. In the sixteenth century and for years beyond that, Hogmanay was when the nation exchanged presents and celebrated. Today, it is still a much more important celebration than in most other countries. It has managed, in part through this significance attached to it, to retain its traditional name, while the language it descends from is most likely gone or developed to the extent that it is unrecognisable. So, in short, we don’t know where the word Hogmanay comes from. The Elgin Records show the first recorded use of the word in 1604: delatit to haue been singand hagmonayis on Satirday, and it is also recorded a few years after that in a wonderfully disdainful entry of the Scotch Presbyterian Eloquence: It is ordinary among some plebeians in the South of Scotland to go about from door to door upon New-years Eve, crying Hagmane. The first theory on the etymology of the word stems in the Auld Alliance between Scotland and France, when many loanwords came into Scots from French. Old French aguillanneuf developed into hoguinané in a Northern French variant, meaning a gift given at New Year, a children’s cry for such a gift, or New Year’s Eve itself. This fits in with the sentence above, from the Scrooge at the Scotch Presbyterian Eloquence, and also with the tradition of children going from door to door for gifts and sweets on Hogmanay, although this died out when Christmas became popular once more and when Hallowe’en started to be observed. There is a Manx song which begins, To-night is New Year’s Night, Hogunnaa. However, the modern forms, Hob dy naa and Hop-tu-Naa mean Hallowe’en. In favour of this second theory we have the fact that there was no m in Southern Scottish forms of Hogmanay , suggesting it was added. However, the etymology of the Manx word is too far removed from the Scottish definition. New Year’s Eve in Gaelic is, consistantly, Oidhche na Bliadhn(a) Ùir(e); “The Night of the New Year” and Oidhche Challainn; “The Night of the Calends”. However, the phrase thog mi an èigh/eugh is pronounced [hok mi ˈɲeː], meaning “I raised the cry”, which is similar in pronunciation to Hogmanay. 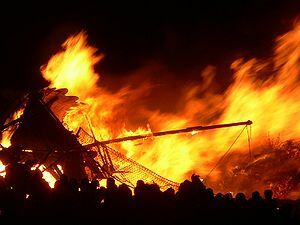 A Viking longship is burnt during Edinburgh’s annual Hogmanay celebrations. If we look beyond the French, Manx and Gaelic words which could be the source of the word, we reach Old Norse. The forms in each of the three languages could have come from the Old Norse folk-lore of haugmenn (“hillmen”, or “elves”) banishing trolls into the sea, or á læ (literally, “into the sea”). So, while the Scots word could have come from French, Manx or Gaelic, which ever of the three, it could have come originally from Old Norse. At seems a little far-fetched that a story about elves and trolls means New Year’s Eve, but the form has traveled over so much space and time that it’s not inconceivable. Now, I’m off to welcome in the new year, so please forgive any typos – I’ll check it over in 2013! Fancy banning Christmas! This explains a lot. Well it was banned in England too… it’s just that the effects didn’t last for 400 years.